And where would we be without our trusty cart! Our faithful cart squelches, stomps and frolics its way from town to town, spewing merriment, joy and a thick layer of green slime wherever it goes! Sure, occasionally someone gets eaten. But just look at that little smile! How could anyone stay angry at something so cute. It’s not just a transportation method, it’s also a friend. The cart is a solid, hefty piece cast in top quality resin. That being said, the level of detail in the model is nothing short of superb. Mouldy roof tiles, cracked windows and tatty old posters adorn the cart and add to the creaking, lumbering look. 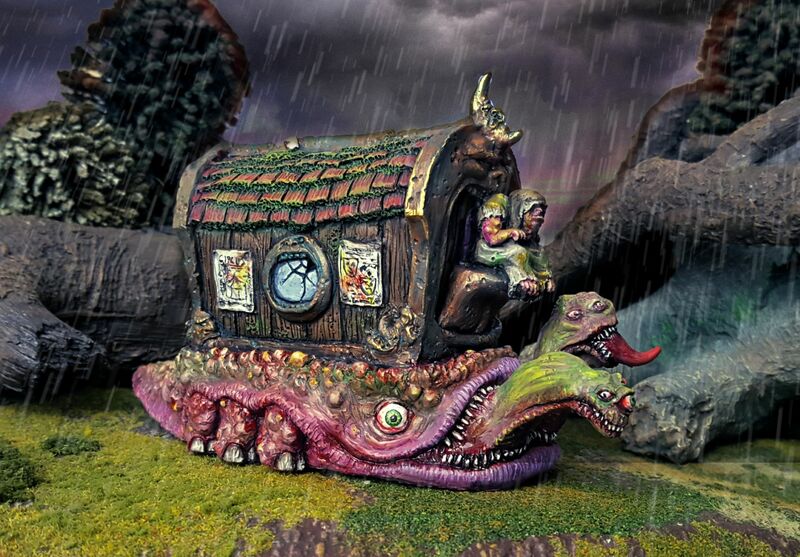 This model makes a fantastic centrepiece for an army- counting as a chariot, monster, demon mount or whatever rules a suitably deranged mind can come up with. To say nothing of the driver himself! What an unsavoury looking fellow like that is doing is anyone’s guess.